No Puedo Vivir Sin Ti, by Taiwan director Leon Dai, has won best movie at the Golden Horse Awards, seen as the Oscars for Chinese-language films. The real-life drama about a suicidal single father triumphed in a category dominated by Chinese films. Filmmaker Dai, 43, wept as he accepted the prize at the ceremony in Taipei. He has been quoted as saying the film's Spanish title sounded more emotionally fitting than the English equivalent, Can't Live Without You. The feature, filmed in black-and-white, follows the fight of a single working-class father from the port city of Kaohsiung, as he tries, unsuccessfully, to secure his daughter an education. Finally, clinging to his daughter, he threatens to jump off a bridge. "I'd like to thank the people of Kaohsiung, no matter whether the government or the everyday citizens," said Dai as he accepted the prize on Saturday. "We couldn't have been able to finish it without their support." 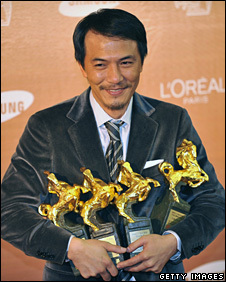 The film won three other awards - for best original screenplay, outstanding Taiwanese film of the year and best director. Meanwhile, Li Bingbing won best actress for her role in Chinese spy thriller The Message. The best actor trophy was shared, for the first time ever, between Huang Bo, for the black comedy Cow, and Nick Cheung, for the action movie The Beast Stalker. The Golden Horse awards judge Chinese-language films from Taiwan, Malaysia, Singapore and China, including Hong Kong and Macau. Correction 1 December 2009: The headline on an earlier version of this story mistakenly said the award ceremony was held in China. It was, in fact, held in the Taiwanese capital, Taipei. Taiwan and China have been ruled by separate governments since 1949, although the Chinese government continues to regard Taiwan as part of its territory.